A vast collection of musicians and singers can be found in Buncombe County, or the greater Asheville area. Traditionally, this area exhibits a variety of musical styles, including gospel, bluegrass, old time, mountain swing, and ballad singing. J.E. and Wade Mainer are from the Buncombe County area, which additionally today claims well-known old time fiddler Marcus Martin. Today, the area still boasts a variety of musical styles, but the majority of the traditional artists in Asheville are sticking with bluegrass and old time music. Buncombe County JAM is held at the Black Mountain Center for the Arts in Black Mountain every Wednesday from 3:30 – 5:00 throughout the local school calendar. 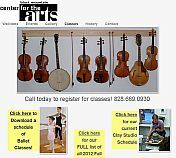 The program is offered to youth grades 3-9 and offers instruction in banjo, fiddle, guitar, mandolin and bass, and also offers opportunities to learn traditional mountain dance and songs.